Anselm prays the ontological argument. Direct address to God is the perfect mode in which to argue for God’s existence. “Come now, O Lord my God. Teach my heart where and how to seek you, where and how to find you.” Anselm carefully crafts his argument, like a finely tooled machine. He then sets it within a cathedral. The wheels turn and the bell peals. In a hall already alive with the murmuring of prayers, the argument sounds. It adds its voice to petitions and supplications. The reverberations reflect off the surfaces of icons and the tombs of the Christian dead: praise to the God greater than all of our thoughts. J. L. Mackie is unconvinced. What good is a necessary being, standing there in one of the darker corners of the universe, mocking our ontological mutability with its incessant there-ness? Such a being is only reflexively necessary, but not necessary for anything. An essence that requires existence evinces only a truncated necessity. The ontological argument is no cause for belief. Faith seeks understanding. Not blind, faith is a way of seeing. “I do not seek to understand in order to believe; I believe in order to understand.” Faith seeks by peering into dim mirrors and contemplating arcane texts, it places its fingers on the surface of relics, feeling out the cracks where divinity seeps through. The argument has no apologetic utility. Abstracting it from its prayerful setting and dissecting it as a piece of pure logic is like removing the eye of a painted portrait and treating it as an anatomical diagram. Set properly within the face of prayer, it shines out as an expression of wonder at the divine greatness. Anselm names and renames his book. It is first fides quaerens intellectum. With no author beneath its title, the little work goes out to converse with the world. When it returns, ruffled and marked all over with marginal notes — new thoughts gathered from abroad — Anselm lifts it up and gives it a new name: proslogion. A word that journeys forth. 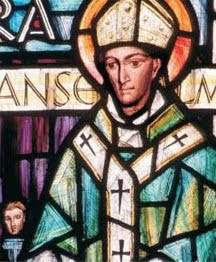 Anselm’s argument fails only when we treat it as an argument. It does not seek converts, but fellow pilgrims. As it turns our minds to God’s greatness and to prayer, it succeeds.